It looks like it's time to play a few drinking games inside the Shark Tank using these party cups with one thing in mind. The 180Cup not only will hold a full 16 oz. cup of beer coming from the keg, you can then turn it over and do your favorite shot as the bottle is being passed around. Geese just writing that bring back some fuzzy memories that "I think" I had a good time, but still not exactly sure. Two Brothers Irving and Soloman Fallas, are the inventors of the 180Cup that devised what looks like the ultimate disposable party cup. This looks very similar to a lot of plastic 16 oz. cups on the market and it got me wondering how easy would it be getting a new patent on such a common product? After spending way too much time trying to see if the 180Cup was successful in getting a patent or even a patent pending on this invention, I couldn't find anything that says Soloman or his Brother Irving was successful in doing so. It doesn't mean the Fallas don't have some kind of intellectual property rights to this invention, but it's not readily available that I could find. At first glance you would think every Liquor Store close to every College in the Country would be selling the 180 Cups as College Students clearly is their target market. The last time the FaceBook page was updated back in July was for an update that 180 "Party" Cup is Now Available at Amazon which is always a good sign, but not very convenient when you go to pick up the keg and ready to get the party started. It looks like the website is also being updated at this time with a mention of "Shark Tank" but no further information at this time. Would I invest in the 180 Cup if I was one of the Sharks? Probably not because my Beer Pong Days are a distant memory, but I was dam good at playing quarters back in the day if I do say so myself. I'm not even sure I would want to play quarters with the 180 Cup's Shot Glass being so high, it would take too long in between drinks. As far as what the Real Sharks will think about this invention, this one's a tough one. If Soloman Fallas can prove 180 Cup has intellectual property rights to a Plastic Cup/ Shot Glass Combo and you won't be seeing a bunch of knockoffs here in the near future, there's most definitely a big market for this product. The biggest problem that most likely will keep a lot of the Sharks out of this deal is this invention is specifically made for promoting excessive drinking. Will the Sharks be willing to invest in what some might deem a controversial product promoting excessive drinking? This will no doubt be an interesting episode on how the Sharks responsibly handle the 180 Cup when they are sure to do a little partying inside the Shark Tank themselves. 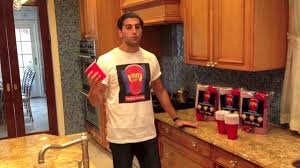 With a retail price of only $12.99 for 50 Party Cups, it's a unique enough idea to become very successful after being seen on the Shark Tank Show and into Liquor Stores across the country. Got a couple of packs at convenience store on campus.What a fun cup! it's really just the novelty. i'd rather buy plastic shot glasses in addition to red cups... and it's a lot cheaper too. They said during the show that it's the same price as solo cups... yeahhhh right. I wouldn't play flip cup with it because it unbalanced with the "shot glass" more to one side and beer pong seems like and issue too because, again, the shot glass is there. Exactly, you are drinking alcohol and you are worried about germs on the table transferring to your cup? Come on. They played him. Damion let the other shark know that he wanted this deal. You'll see it every once in awhile, all the sharks will help one shark get a great deal. The dude lost 5% not taking the deal right off the back, but the other sharks really helped Damion.